Polaroid’s PD-G55H is a multi-function dash cam that’s capable of taking both stills and video, records both location and speed via a built-in GPS radio and includes a G-sensor for automated recording. It isn’t a perfect unit, but it packs in pretty much all of the features you absolutely need to have a dash cam at its price point, and none of the issues it does have are real deal breakers. Dash cam technology has come a long way in recent years, and Polaroid’s PD-G55H is pretty representative of where we’re at right now, in terms of features. 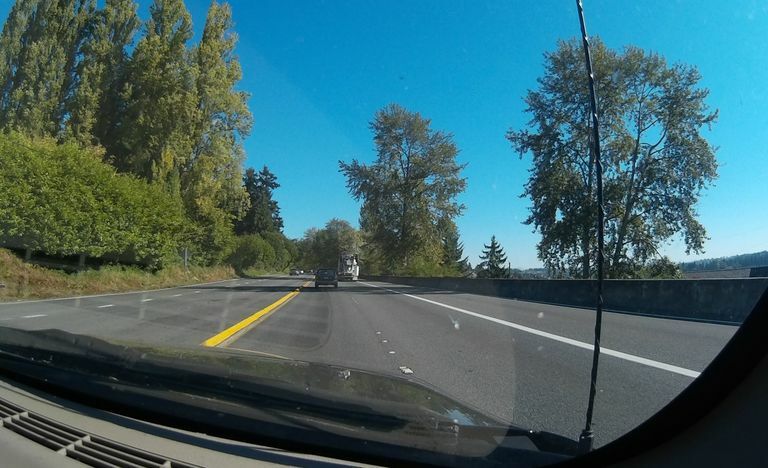 At a very basic level, a dash cam has one function that it has to accomplish, and it’s a pretty simple one: record video, straight ahead, and keep doing it. Any type of dash cam can do that much, as can basically any dash cam alternative, like a digital camera, cell phone, or even Go Pro for that matter, but there are some absolutely vital features that set units like the PD-G55H apart. While having a visual record of your commute can come in handy if someone happens to T-bone you while you’re obeying all applicable traffic laws, a basic video record isn’t always going to cut it. That’s where GPS can come in. And since video files can very quickly eat up even 32GB of storage, the ability to continuously overwrite older videos, or even record on-demand with no user input, is also key. Records great video and picture quality. The unit is compact and lightweight. Includes both GPS and a G-sensor. Mini-CD format used for included software. Lack of online documentation may lead to difficulties down the line. The battery was not charged on arrival. Polaroid’s PD-G55H packs a lot of great features in a lightweight, slick-looking package. Possibly the single most important feature is GPS, which is something you’ll probably start seeing in more and more dash cams because it’s extremely useful to have. The way it works is that if you have the feature turned on, the dash cam records your physical location and encodes it along with the video. So while you can watch videos recorded by your PD-G55H in any software that’s capable of handling MOV files, you’ll need a special sort of software to get the most out of it. The PD-G55H also includes a G-sensor, which you might be familiar with if you own a modern smartphone like an iPhone. In the case of smartphones, the G-sensor, or accelerometer, is most prominently used by the phone to know when to “flip” the screen from portrait to landscape. In a dash cam like the PD-G55H, an accelerometer has a much more important function to perform. While you can set the cam to record constantly, and it will automatically overwrite old video files when the storage media fills up, you can also use the G-sensor to initiate filming only when a sudden change in velocity occurs—like, say, someone slams into your car, or you slam on your brakes. In addition to the GPS and G-sensor, the PD-G55H also has a handful of optional safety features that you can take or leave as you will. For instance, the unit has a sort of no-frills lane-keeping system you can turn on that will sound an alarm if you drift out of your lane. You can also set an upper-speed limit, and if the dash cam detects that you’ve accelerated beyond that point, it will sound an alarm. If that sounds like it could get annoying, you can leave those features off. Or if you have a teen driver, and you’re not completely confident in their driving abilities just yet, you can turn them on. Then you can pop out the SD card late at night and see exactly where, and how fast, they’ve been driving. The good news about the bad news is that the biggest issue with the PD-G55H has absolutely nothing to do with the actual operation of the device. The issue is that the dash cam comes with a handy little software program that’s capable of reading embedded GPS data, but it comes on a mini CD. If you’re like many people, and you don’t even have any computers with optical drives anymore, you’re going to have trouble installing the software. There are third party solutions out there that are capable of reading the type of metadata the PD-G55H encodes with the video, and there are always workarounds, like finding a computer with an optical drive and copying the software to a USB stick or SD card, but it would be nice if Polaroid, or GiiNii, which is the company Polaroid licensed to produce the unit, offered the software via download. The lack of online support could also be an issue if you lose the owner’s manual since Polaroid’s site only provides you with a GiiNii customer support email and leaves it at that. GiiNii provides a handful of owner’s manuals, and firmware updates, for their own products via their website, but nothing for the Polaroid-licensed units like the PD-G55H at this time. Another potential snag is that the battery was dead on arrival in our test unit, and a survey of other PD-G55H users found that this is an at least somewhat common occurrence. This could end up being an issue in terms of battery life since you aren’t really supposed to allow lithium polymer batteries to fully discharge. This may or may not even be an issue, depending on your point of view. The whole idea behind a dash cam in the first place is that you install it on the dash or windshield of your car, which has a ready power source in the form of an onboard 12V electrical system and ubiquitous cigarette lighter or 12V accessory socket that you’re probably already using to charge your cell phone. Unlike your cell phone, there’s really no compelling reason to unplug a dash cam and carry it around to the point where you’d worry about the battery. The Bottom Line: Do You Need a Dash Cam? If you’ve asked yourself whether you really need a dash cam and come to the decision that you do, then the PD-G55H is worth a look. The key features are the GPS tracking and accelerometer, which are absolutely vital if you want to get the most out of a dash cam. For instance, if you’re hoping to be able to use footage from your dash cam as evidence—provided that it’s legal to use a dash cam as evidence where you live—then having that baked-in GPS data could really come in handy. The only real issue is the way that the software is delivered, but that’s easy enough to work around if you’re expecting it. The Polaroid PD-G55H records video in the MOV format and still pictures using the JPG format. Video is recorded in 1080P with a fisheye lens at 30 frames per second (FPS) and displayed on a compact 2.4 inch screen.